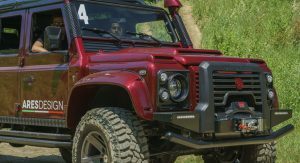 The Land Rover Defender as we know it is dead. 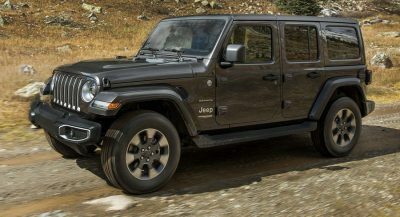 After 70 years, the model has been killed off at a time when fuel efficiency is everything and consumers are demanding affordable and accessible crossovers. Admittedly, Land Rover is developing an all-new Defender which, in every measurable way, should be better than its predecessor. But will it have the same soul? That question has yet to be answered. 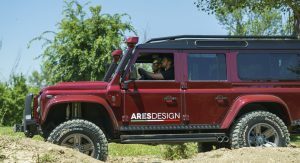 As we wait, the Ares Design Land Rover Defender has launched as a limited-run that looks to retain the character of the original but update and improve it with new parts and an altogether more aggressive and outlandish design. 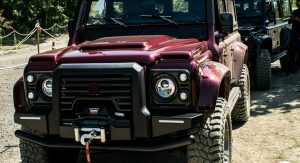 Does it bring the Defender into 2018 and make a great even better? We flew to Modena to find out. Ares Design is not a car manufacturer but rather a coachbuilder, a point founder Dany Bahar drives home repeatedly during our visit to the company’s headquarters. 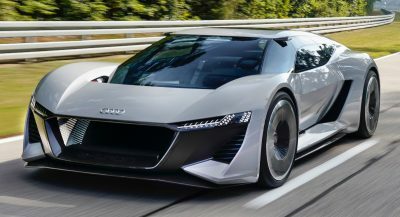 Formed in 2014, Ares Design has been quietly slaving away building unique cars for its ever-growing list of clients. 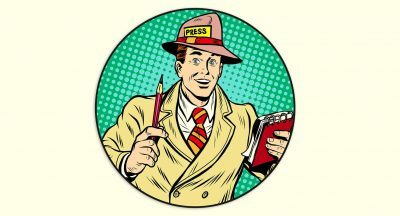 It’s now looking to expand, hiring dozens of new staff, overhauling its facilities and working on new and innovative projects. Bahar has well over a decade’s worth of experience working in the upper-echelons of the automotive world. In the early and mid-2000s, he served as Red Bull’s chief operating officer and helped launch the Red Bull Racing and Scuderia Toro Rosso Formula One teams. Shortly after his tenure at Red Bull, Bahar joined Ferrari to head up the marque’s global brand department. A couple of years later, Bahar’s most talked-about career move saw him become the chief executive of Group Lotus. Tasked with turning around the carmaker’s financials, Bahar infamously spearheaded a new product plan which saw Lotus unveil five all-new concepts at the 2010 Paris Motor Show. By 2012, there was no sign of any of these models reaching the production line and in June that year, Bahar was ousted from Lotus following an investigation into his expenses. 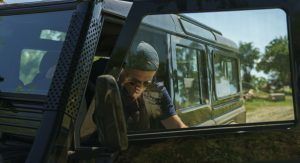 In a roundabout way, the ambition and willingness to go big or go home throughout Bahar’s career have made him the perfect man to head-up a coachbuilding company that wants to do things a little different. While some other companies in the industry mess with both the internals and externals of already-popular and successful vehicles, Ares Design doesn’t want to do that. Instead, the company makes no false pretences about its ability to transform a vehicle’s mechanical components and make it better. All it wants to do is create beautiful products, shaping their exteriors and interiors to perfection much like a plastic surgeon takes a model and turns her into a supermodel. The firm’s overhauled Defender does seem at odds with this philosophy. 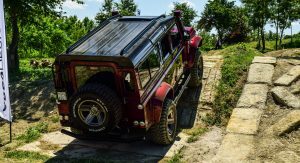 While both its interior and exterior have been transformed, Ares Design also made the bold decision to mess with the internals of the iconic off-roader. 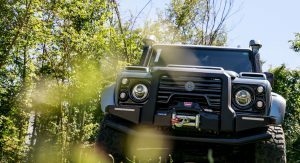 To create its beefed-up and massively anti-social off-roader, Ares starts with Defenders from 2014 and completely strips them down to their shells. From there, sound proofing is applied throughout and, as we’d soon discover, good sound insulation is a necessity. Next, Ares overhauls the suspension and braking systems with Fox high-pressure dampers and AP Racing brakes up front with 362×32 mm discs and six-piston calipers. The propshaft, driveshafts and CV joints have all been strengthened. 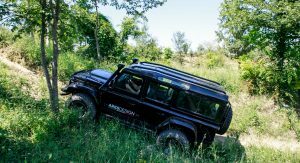 To ensure its Defender can tackle all kinds of terrain, Ares replaces the standard 2.2-liter diesel engine with a Land Rover V8 that’s been stroked to 4.7-liters and churns out 282 hp and 440 Nm of torque. For performance-hungry owners, a supercharged version with 475 hp and 650 Nm of torque is also sold. Both engines replace the standard five-speed manual gearbox with a six-speed tiptronic automatic transmission. A Milltek sports exhaust system is also featured and, at the press of a button, the exhaust flaps can be opened. It Talks The Talk, But Does It Walk The Walk? Mechanical changes aside, it is the visual transformation that you’re immediately confronted with when first looking at the Ares Defender. There’s carbon fiber front and rear bumpers, flared wheel arches, new headlight surrounds and a bespoke grille that all exude aggression and pure and unadulterated savagery. Looking at this behemoth, it’s hard not to feel intimidated. However, any sense of apprehension is quickly quelled once you step inside. 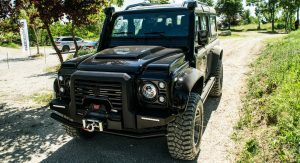 Ares has applied beautiful, hand-made carbon fiber throughout the cabin alongside luscious leather to create a feeling of luxury that’s completely foreign in a Defender. These touches, alongside the authoritative driving position, make you feel at ease when piloting the monster. 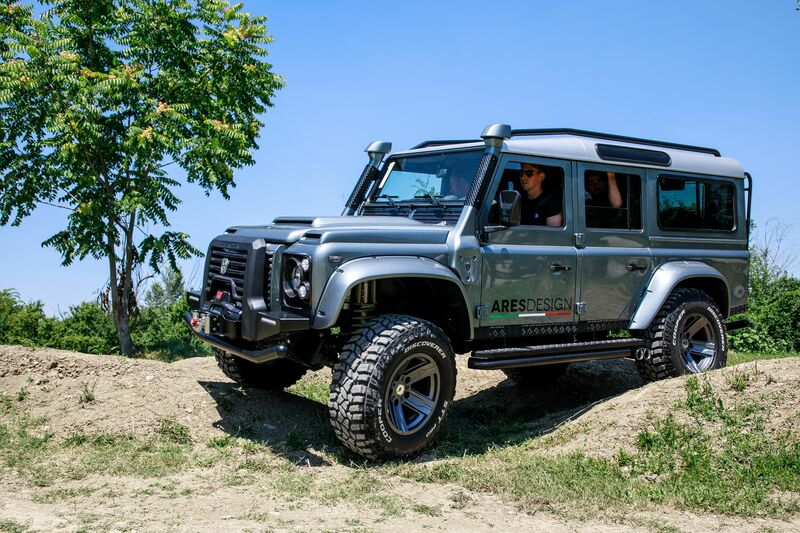 To experience the Ares Design Land Rover Defender, we headed to an off-road facility just outside of Modena. Our time behind the wheel was limited but it was enough to get a decent impression of the vehicle and to analyze what it does well and what needs to be improved. Turn the key and the supercharged V8 engine barks into life. That’s with the exhaust in quiet mode. Open up the valves in the exhaust and the Defender sound ungodly. Close your eyes and you could be forgiven for thinking you’re sitting atop a trumpeting elephant in the middle of a raging thunderstorm. There’s no need for a 4×4 to sound like this but we’re so glad it does. Turn the wheel and you’re greeted by typically heavy Defender steering. The turning circle is gargantuan. That, combined with a brief look through the mirrors, reminds you of how massive this creation is. 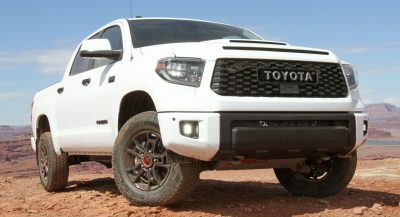 Is it actually useful off-road, however? The short answer is pretty obvious: of course it is. 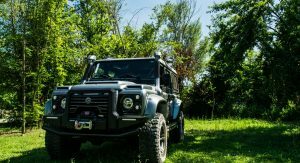 Driving in low-range and with the rear differential locked, the Ares Defender climbs hills without breaking a sweat. At times it feels as if it could crawl its way up a 90-degree dirt road all while looking good, sounding impeccable and motivating you to keep pushing and exploring its limits. Our off-road course for the day consisted mainly of steep ascents and descents but did include sections where the Defender was forced to contort and twist to the undulating terrain. Aside from a few knocks of the suspension over some of the more extreme obstacles, it handled everything without complaint. Perhaps because I’m an immature idiot or one that’s simply addicted to roaring exhaust notes, I found myself opening up the exhaust valves each time I stepped into the Defender throughout the afternoon. Even at idle, the car’s rumble is intoxicating and instantly makes you smile from ear-to-ear. 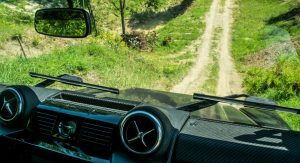 Even the most simple operations in the Ares Defender, like shifting from drive to reverse, are a pleasure thanks to the new materials lovingly incorporated throughout the cabin. All in all, it’s quite the machine. It’s not without its flaws, however. On paper, having a huge set of AP Racing brakes sounds cool. In practice, they are a pain to operate and in the vehicles we drove, simply didn’t work as they should have. 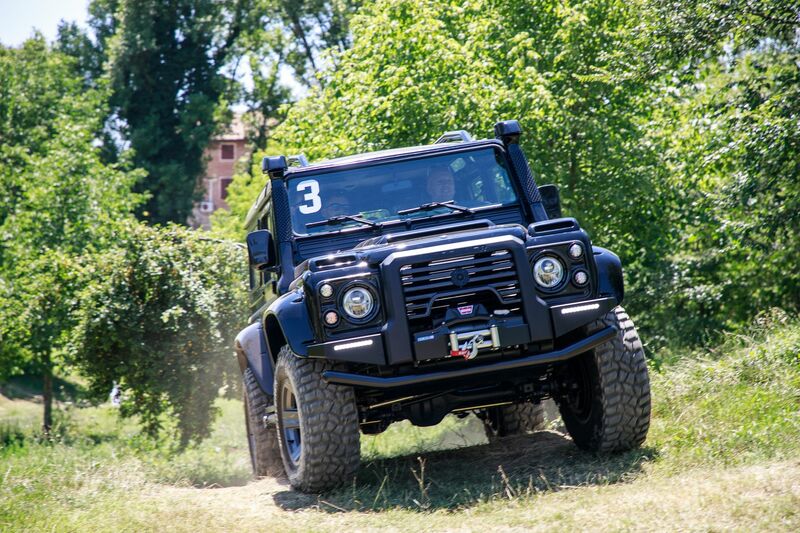 Press your foot firmly on the pedal, depress it roughly 70 per cent of its travel, and the Ares Defender will continue rolling forward without a hint of slowing down. Press it 80 per cent, the same story. 90 per cent, the same again. 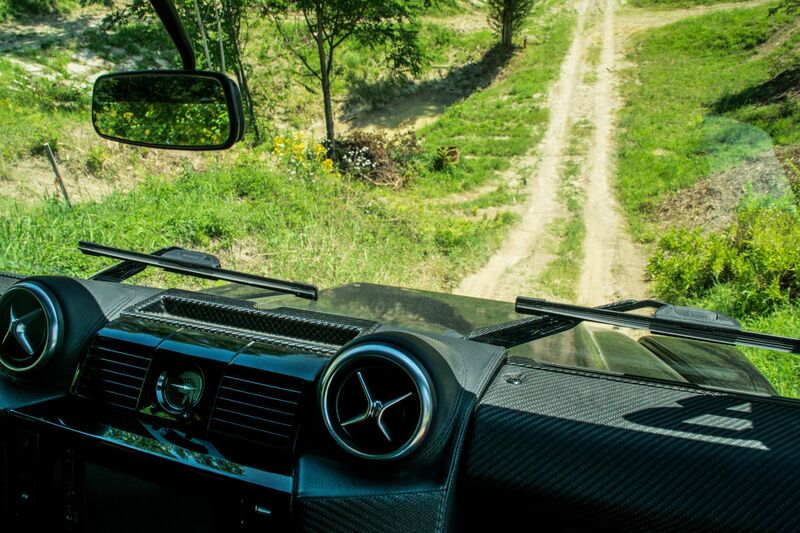 It’s not until you’ve pressed the brake pedal just a few millimeters above the floor that the brakes seem to engage and the Defender actually comes to a stop. It’s unsophisticated and a little bit frightening. 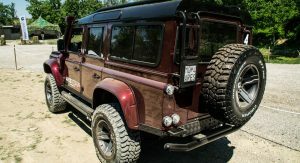 We didn’t have the opportunity to drive the Defender on the road, but dealing with these brakes at higher speeds could be enough to turn some buyers away. Simply put, they desperately need further development. 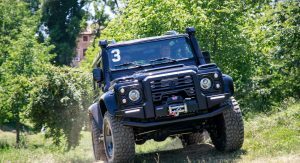 For the most part, the Ares Defender delivers the additional refinement the Defender needs with some typical Italian flair. 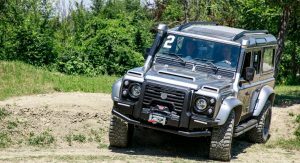 However, it was hard not to walk away from our experience without thinking that a little too much work has been done to the Defender’s chassis, suspension, and braking system. In this case, perhaps less would be more. 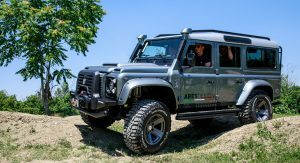 Ares Design will build 53 examples of its Defender with prices ranging from €215,000 for the naturally-aspirated model and €245,000 for the supercharged monster. Half of all units planned have apparently been ordered by a single customer. 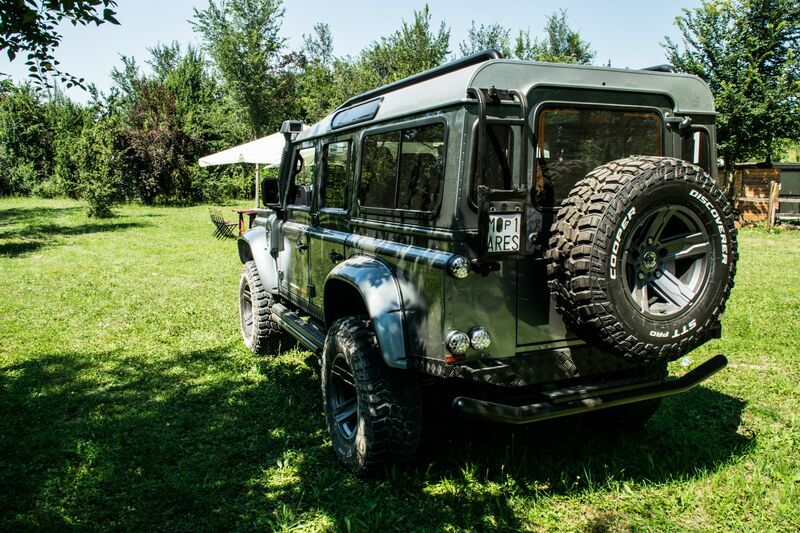 So, brake issue notwithstanding, this improved Defender is already a hit. 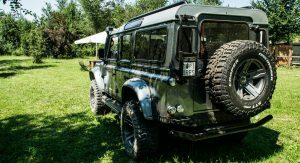 Who in their right mind would pay €245,000 for a Defender????? Too expensive. Full stop. Bahar needs to exit the bubble. I’m a big 110 fan. This looks cool, but they really didn’t put it through the paces. Everything in the pics my FWD Sorento can do – I know cuz I’ve done it.